Sara started riding at the age of 9 and owned her first pony when she was 10. Showing natural flair and ability she soon progressed, finding herself selected for junior affiliated team show jumping events at the young age of 12. Sara left school at 16 and became a qualified instructor after studying as a pupil at Addington Equestrian College . Once qualified, Sara set up her own teaching practice and livery yard. Paula started riding when she was 6 and has remained in the saddle to this day. From age 4 she grew up in South Africa but after leaving school returned to England to work. On her return to the country Paula worked at an equine vetenry practice, with point to pointers and as a groom / rider for Mary Robins (international dressage judge). In 1990 Sara and Paula went into partnership forming the ‘Walker & Hush’ team. Both Sara and Paula have remained involved with horses since they started riding and have spent their entire working lives in the horse industry. The unpredictable world of horses has moved the business in many directions over the years giving Sara and Paula the opportunity to work with all types of horses in all spheres. They have a strong background in breeding, stud work, yearling preparation and are well know for their successful backing and training of youngsters. They have also earnt themselves a good reputation for re schooling to improve problematic horses and are notorious for being able to ‘sweeten’ stale horses. The one constant in the yard however, has always been the enthusiastic involvement with racehorses. They have always worked closely with thoroughbreds, pre training horses for the likes of Toby Baling, Henrietta Knight, Nicky Henderson and Mel Brittan. Both Sara and Paula have remained focused on the competition aspect of their careers. Sara started eventing in 1992 and after realising an aptitude changed direction to concentrate on the dressage phase in 1999. Sara now competes in dressage at advanced medium level. Paula is an accomplished rider and has been eventing for over 12 years. She competes at intermediate level with her current horse. 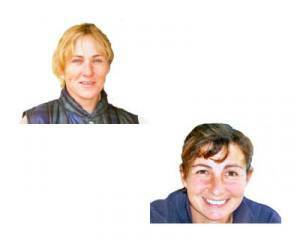 Sara and Paula are competent in every aspect of the horse world. They have knowledge and understanding that can only be realised by a lifetime of ‘hands on experience’. For more information of the services Sara and Paula provide to Diamond Racing, please refer to the ‘Horse Welfare’ section of our website.